No matter your industry, THR can help you manage tools and materials critical to your organization. Public Works departments to manage maintenance & repair items off trucks. 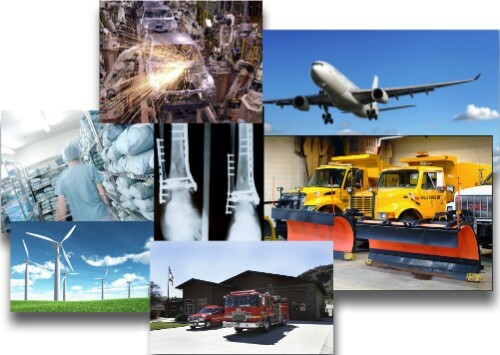 Manufacturing companies to manage consumable & MRO items. Fire & Law Enforcement agencies to manage the turnout of helmets, boots, weapons, and IT equipment. Using RFID technology we can help you keep up with state and federal asset control requirements. Medical facilities to manage expensive instruments, Doctors' computers, equipment, and other important items. Manage turnout and supplies in Ambulances. Every industry uses supplies to manufacture a product or perform a service or function. In a lab you use safety goggles, lab coats, hair nets, etc. In an office you use pens, toner, stationary, etc. In a power plant you use gloves, safety equipment, batteries, etc. THR can manage those supplies down to the user level, saving your organization tens of thousands of dollars each year.